In formal occasions or business conference, you must wear divine and neat formal suits to show basic respect and showing your strong attention. It is one of the basic etiquette that you should know in advance when you come to this situation. As we all know, a set of delicate and divine suits are mostly made of wool, silk, cashmere and other natural fabric material. Among all these similar styles and pattern, you must have got a visual fatigue totally. 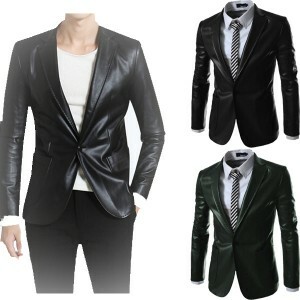 However these mens leather blazers will give you an extraordinarily surprising impression. With the same style and pattern of these formal suits, you will find that this mens leather blazer with smooth and bright material will make you shining and attractive in the crowd. It will give you a neat and straight wearing effect. They will show you a professional and formal appearance as these formal suits do. Just because of its leather material, you will be looked special and unique. When you wear these formal suits, what you wear inside to match with is undoubtedly to be these formal shirts. White shirts are the commonest one to be matched as you see. 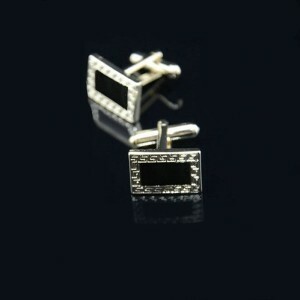 However, what you may ignore is that what you need is a unique mens retro geometric cufflinks to have a particular decoration for cuffs. Generally speaking, the length of shirts is usually 2 or 3centimeters longer than the suits’. The purpose of this design is to show your fashion and unique cufflinks. In my opinion, these retro geometric cufflinks will show your gentle and elegant temperament, in the same time, you will be regarded as a tasteful man. Matched with different shirts with different colors, these cufflinks will be suitable for you to wear in any occasions to show different looking! Take this men’s leather blazer and cufflinks home, they will be your good helper for you to show a formal and elegant appearance!